Limited size and resources have not limited Basque creativity. From the clay-rich soils of Araba to the rich veins of iron in Bizkaia and Gipuzkoa and the dense forests of Nafarroa, the landscape of Basque country has shaped the daily lives of its people. In turn, the landscape has been molded by its people, who shape trees to harvest and build vibrant urban and industrial centers of iron, concrete, and glass. Lantegia, the workshop, molded the clay into pitchers and bent the iron into banisters. Modern Basque lantegia work on developing green energy and clean transportation. The Cooperative Movement, with principled worker-owned and run businesses, found a home in Arrasate-Mondragon (Gipuzkoa). Many cooperatives set global standards in wage and production and are a vital part of the Basque spirit of innovation, facing challenges of a changing world and environment. In the Folklife Festival Lantegia, master artisans from Basque county demonstrated their skills in ironwork, stone carving, painting, and more. Visitors were able to ask questions, touch their materials, learn their stories, and find their products in the Festival Marketplace. A shoemaker at La Maison Prodiso’s workshop uses an industrial sewing machine to hem the canvas that forms the upper part of the espadrille. La Maison Prodiso is filled with stacks of handmade espadrille shoes in bright solid colors or festive stripes. Jesus Maria Lazkano in his studio in Urdaibai (Bizkaia). Master potter Blanka Gomez de Segura demonstrates how to throw a traditional Basque pot. Blanka Gomez de Segura’s workshop is next to a 900-year-old kiln. Master stone carver Bernat Vidal poses with an example of his work featuring traditional Basque motifs of the sun in sandstone. Although weaving was once a large industry in her native Durango (Bizkaia), Olga Uribe Salaberria is one of the few to carry forward the tradition. Olga Uribe Salaberria weaves linen cloth on one of her looms. Since 1977, the Errecart family at La Maison Prodiso has been hand-making espartinak (also called abarketak), or espadrille shoes. Director Sandrine Lasserre learned the craft from her father, Jean-Pierre Errecart. As workplace regulations threatened to make the soft shoes obsolete, the espadrille business adapted to changing fashions, utilizing a variety of heel heights, materials, and colors. Today, in addition to being worn with the traditional Basque dress, they are customized for weddings and special occasions and have inspired new trends in footwear worldwide. Basque iron furnaces date back to medieval times. During the nineteenth century, hematite iron mines in Bizkaia fed British and Spanish foundries and spearheaded industrialization at home and abroad. The sudden wealth spurred large-scale shipping, banking, and energy production. Smaller businesses and artisans continued to be tied to the land while adapting to the new production methods. The Alcoz family comes from Urbiola (Nafarroa), a town whose roots go back to ancient burdinola (ironworking). César Alcoz and his brothers learned the trade from their father, and César opened his own workshop in Markina-Xemein (Bizkaia). There he forges traditional pieces such as balconies, banisters, and garden gates in modern styles. Examples of Alcoz’s work were integrated into the program’s decorative fence line. Using an iron forge from the Blacksmiths’ Guild of the Potomac, he create pieces of ornamental fence. 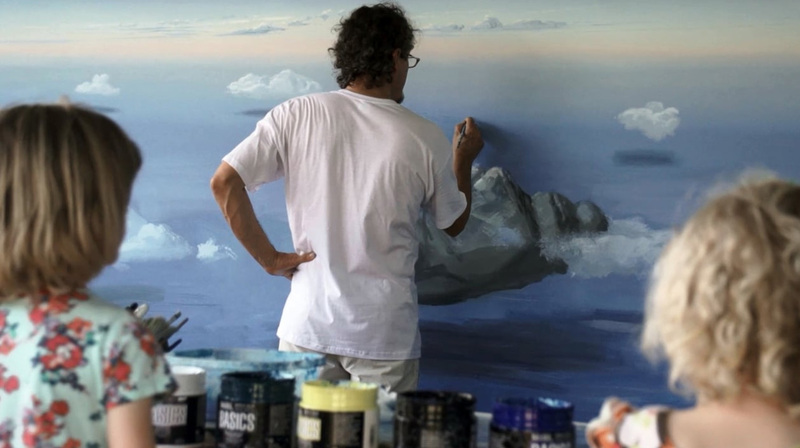 Jesus Maria Lazkano received his Ph.D. in fine arts from the University of the Basque Country, where he has been teaching painting since 1985. An extreme mountain climber and a sailor, Lazkano’s mural-sized acrylic paintings mix images of the oak forests and mountains around the Urdaibai estuary with manmade environments, especially cityscapes of Chicago, New York, and Rome. His work explores how our environment shapes human culture and thought, reflecting that certain Basque traits—inventiveness, wanderlust, and auzolan (working together for the good of the community)—come from the will to endure rough waters and craggy mountains of the Basque homeland. With his studio near 15,000-year-old paintings in the Santimamiñe Caves (Bizkaia), he is part of the timeless dialogue between humans and our natural and constructed landscapes. He will be busy at the Festival painting two eighteen-by-seven-foot canvases. Head to the Marketplace for poster prints of his landscapes and seascapes. As a first generation potter, Blanka Gomez de Segura learned the art of euskal zeramika (Basque pottery) from master potter Jose Ortiz Zarate when the Basque government offered scholarships for youth to learn traditional skills. Her workshop and home sit next to a 900-year-old kiln. Her focus is white pottery, a Basque innovation from the Industrial Revolution. Allying with Britain in iron ore extraction and smelting techniques, the Basques traded for English tin, the essential element to create a pure white glaze. Since it was so expensive, the glaze was used only for part of each piece. Through persistence and adaptions, household objects of clay tell the grander stories of Basque history. Gomez de Segura hosted hands-on pottery workshops using terra cotta clay and a pottery wheel donated by The Art League in Alexandria. Her daughter, Itxaso Jayo Gomez de Segura, helped young visitors stamp traditional sun-inspired designs into clay medallions. Mountain ranges of limestone and granite surround Basque country, strewing fields and streams with stones that people traditionally used to build etxeak (houses) and fences. 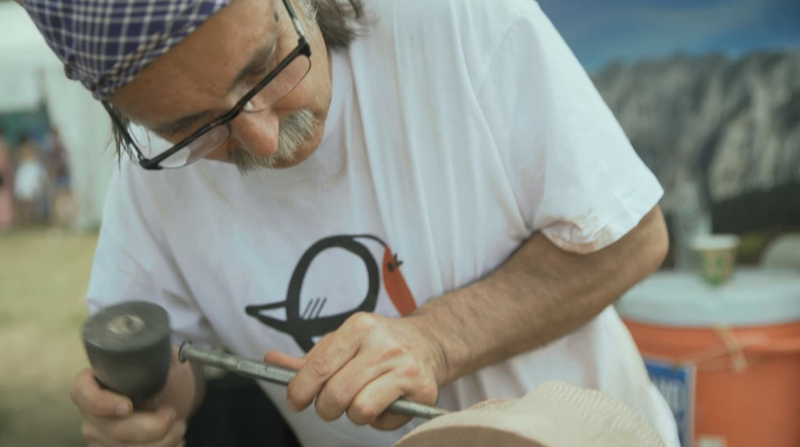 Inspired by the art of stonework, Bernat Vidal trained to be a sculptor and is now a master stone carver. His work includes ancient sun motifs of grave and death markers and historical forms such as family coats-of-arm and crests found on the front of etxeak. With a talent for combining old and new forms, he is also commissioned to create modern stone monuments and commemorative works. His work was integrated into the program’s decorative fence line. During the Festival, he carved a traditional coat-of-arms design in a 550-pound stone from Basque country and replicated a corbel using extra stone from the Smithsonian Castle. Basque country has a long tradition of linen work, yet it has taken a draftswoman from Durango (Bizkaia) to revive this outsourced domestic art. Olga Uribe Salaberria first fell in love with the loom at a crafts fair and began to research historical Basque textile collections. Her engineering background allowed her to analyze the warp and weft of the cloth. With the help of her father, she eventually restored an antique loom that could produce the fine sixteen-count-per-centimeter cloth. Now an artisan with over twenty-five years of experience, Salaberria stocks households with Basque dishtowels, tablecloths, and scarves of various materials, but she is also able to create museum-quality reproductions.